The social sourcing train is leaving the station. Are you on it? Who has much time these days to read big clunky whitepapers, or (dare we admit it), long-winded esoteric research reports? 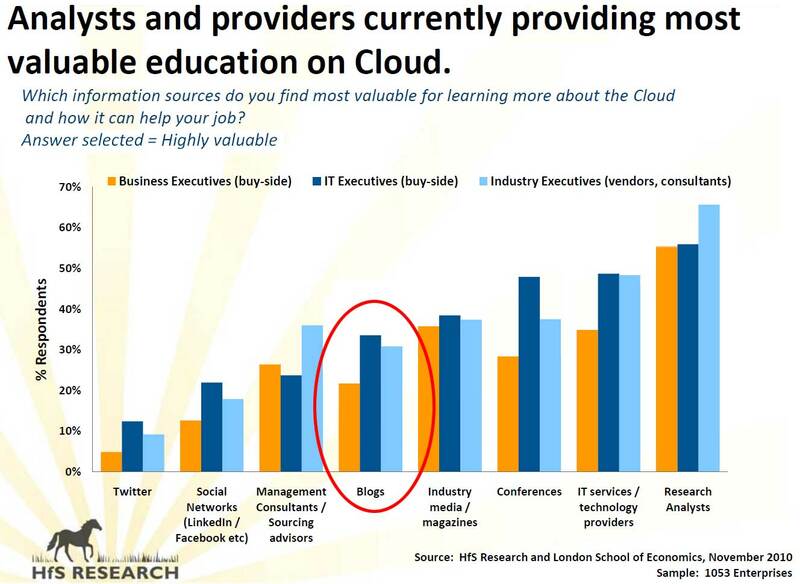 People are increasingly demanding their daily serving of content served up in more digestible and less headache-inducing chunks, as our latest industry-wide study reveals, where more than 1000 study participants across the sourcing industry have voiced the increasing importance of blogs and social media as one of their preferred learning tools for Cloud Business Services. 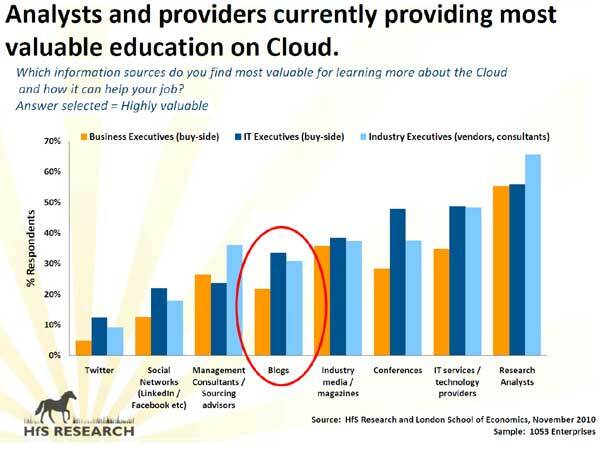 The proof really is in the pudding for us all to see –just ask the professionals who recently took part in the Cloud Business Services study we ran jointly with The Outsourcing Unit at the London School of Economics. As this graphic shows, blogs, especially, are already mainstream social mediums for education to guide major strategic investments. And analysts are the most sought-after information sources too. (Good thing that we, at HfS Research, have both a media brand and a research powerhouse – lucky break!). In our industry, advisors, providers, and other analyst firms are trying to hop on the social bandwagon - visit many of their websites and you’ll find all sorts of takes on social sourcing reality, like Share, Stay Connected, etc. The huge challenge, however, is that they continue to struggle with positioning themselves as thought leaders: What should I say? How often should I say it? Who am I even talking to? Will anyone read past the title? And…in the end, will anyone really care (especially sourcing buyers)??? Having the courage (operative word!) to say what you mean, the conviction to back up your perspectives, the intelligence to make a bit of sense, a twist of humor, and the audience that really pays attention (easy to analyze via analytics) are challenges that Horses for Sources / HfS Research has conquered – and an additional reason why I joined here. I see huge benefits in sharing energy, innovation, collegiality…and a bit of smarts sprinkled in…all feelings of “fitting in” to a larger whole that HfS’s social networking scene has created. Having a voice, a collective platform, a safe environment, and a listening ear – with a global reach – is something that no other firm in our industry has been able to crack. The last time I looked, 37,000 others agreed and opted to sign on here! You can ignore it, rebel against it, say you have no time for it, or think it’s just plain dumb. BUT…c’mon, the reality is that you can choose to either accept our pop culture reality and be part of a broader community than just your own, or you can run from it back to your nest. The data doesn’t lie, and it’s clear which industry stakeholders are struggling to reach their audiences, and those which are getting the message across. 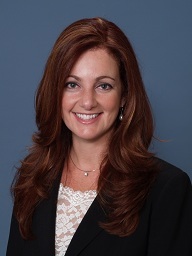 Clearly consultants and advisors, whom I have had extensive experience with during my career, need to do a much better job of educating both the IT and business buyer, when it comes to leading edge issues, such as the Cloud. Yes, you can run and hide OR try to go it solo, but, at the end of the day, when you ask yourself “what did I do today to make the world a better place?” you ought to consider having tapped into a larger social network – at least once – to find the answer. I’ll bet once won’t be enough. You're spot-on with this - but no matter how much things are moving towards "social", people still persist in producing completely dull, unreadable white papers that noone EVER reads. I guess HfS will continue to be in business for a while longer, then! So great to see you crossing the streams here, Lisa. The influencer world is being rewritten in real time. The proliferation of big ideas and data aggregation is just a matter of having the right filters. That's something the traditional analyst world is going to have a hard time figuring out. Lisa, what's actually SOOOOO exciting is... remember that dreaded 2000 ITSA report that nearly killed us? Well... it was time well spent. All those dreams are coming true today. The technology has finally caught up with the human potential. Who woudda thunk I'd ever work for Jeff Dachis? hahaha... remember this preso? have to confess, I just took a sneaky look at those slides... loved the "profitable / non-profitable" chart! I think Sapient have been muddling through to this day! The rest seem to have faded with the distant dream, like it never happened!